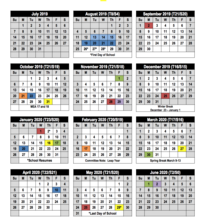 The school board is considering a proposed calendar for the 2019-2020 school year. The calendar was created by a committee of teachers, staff, parents and a student, and was based on feedback gathered by the community as part of an online survey. View proposed calendar. The calendar being recommended by the committee has the first day of school occurring before Labor Day, provides nearly two weeks off for winter break, and aligns spring break with many neighboring school districts. The calendar is expected to come back before the board as an action item at its Nov. 29 meeting. The school board will be welcoming three new members and one returning member at its first meeting in January 2019. Incumbent Shelley Pearson was re-elected on Tuesday night, along with new board members Mark Burns, Tina Riehle and Liz Weisberg. The school board held a business meeting on Nov. 8. Find meeting materials and watch an archived video of the meeting online. You can also read a summary from the board meeting online. Principals and other district leaders joined together with staff from Washington County's Department of Emergency Management and the Sheriff's Office for a workshop on school safety and security. The group reviewed a possible crisis scenario and discussed how they might collaborate to evacuate students safely and reunite them with families in an orderly process. This was just one of many trainings and discussions underway across the district as staff continue to focus on enhancing security in our schools. Additional workshops and training sessions between school staff and county officials will be taking place in the coming months. 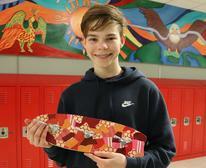 Two student journalists from the high school placed in the top 10 nationally. 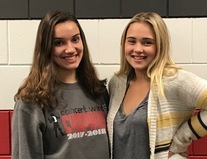 They each earned Honorable Mention in the National Scholastic Press Association Individual Awards. Hannah Sween, current editor-in-chief of the Pony Express student newspaper, was named Honorable Mention for an opinion story. Madison Weispfenning earned an Honorable Mention for her editorial cartoon. The volleyball team finished fourth in the Class AAA state tournament.This marks just the third state tournament appearance for the Ponies, who’s inaugural trip came in 2009 when they also finished fourth. Maddie Whittington was named to the all-tournament team. Watch video. The boys cross country team placed fourth in the Class AA state meet at St. Olaf College. It marked the 16th time in the last 22 trips to state for the Ponies they have placed in the top five. Read more. The girls cross country team finished in fifth place at state. It was the best-ever showing for the Ponies, who placed sixth in 1980, 1983 and 2005. Read more. 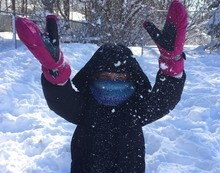 As the weather turns colder, it's a good time to review the district's procedures around school closings, late starts or early releases. Please review our procedures online to better understand how a change in schedule would impact your family. Should a decision be made that will impact the school day we will do our best to notify you as soon as possible with an automated phone call. Information will also be shared in local media, and posted on our district and school websites, and on the district’s Facebook and Twitter feeds (search for Stillwater834). Upcycling takes center stage as a new competition added to Da Vinci Fest, the annual arts and science festival hosted by The Partnership Plan. The contest allows student the opportunity to display their creativity and ingenuity by reusing discarded objects or material in such a way as to create a product of a higher quality or value than the original. More details, including project requirements and submission deadlines, can be found online. Da Vinci Fest will be held on Saturday, Jan. 5, 2019, at Stillwater Area High School.